"A Global Leader in Aircraft Instrument Services"
The Capacitive Type Fuel Qty measuring system utilizes a variable capacitive element in order to vary a precise electrical AC voltage based on the quantity of fuel in the fuel tank. The varying electrical signal, in turn, is used to drive the pointer on a fuel quantity indicator in a manner which is proportional to the amount of fuel in the tank, thereby visibly indicating remaining fuel quantity to the pilot. As previously stated the indicator in this type of system is quite simple, typically nothing more than a meter movement mounted within a case. A meter movement consists of a spool of wire mounted on a pivot and jewel housed within a frame. The frame is in fact a large powerful magnet. As electrical current flows through the wire spool it interacts with the magnetic field of the frame causing the spool to rotate on its pivot and jewel. A pivot is nothing more than a miniature axle. A jewel is a finely ground glass cup within which the ends of the pivot are supported and allowed to rotate. Over time and with constant movement the ends of the pivot will begin to wear down similar to the point on a pencil. Eventually the pivot will become so worn that it can no longer rotate easily. It needs to be sharpened or replaced. As previously stated, a jewel is nothing more than a finely ground miniature glass cup. Glass is fragile; it breaks very easily when mishandled. The glass also becomes worn from the pivot constantly rotating within it. Eventually the glass will become rough and will need to be re-ground or replaced. The frame of the meter movement is a large magnet. A magnet is nothing more than a piece of steel within which all of the electrons, sub-atomic particles, have been aligned within a specific pattern. Eventually the electrons move and return to their original locations according to the laws of physics. With the loss of alignment the magnet loses its magnetic power. However while the magnet is still operating properly it, like all magnets, attracts other ferrous metals. The pivot, manufactured with ferrous metal, is in close proximity to the magnet and it is wearing down from rotating within the jewel. As the pivot wears it throws off tiny particles of metal which are attracted to the magnet. Eventually enough of these particles will become lodged between the magnet and wire spool so as to inhibit free movement of the meter. The unit needs to be completely disassembled and thoroughly cleaned. The floats are very often nothing more than hollow metal balls. These sometimes spring leaks. The fuel must be drained and the float must be resealed. The primary advantage of this type of system is cost. The components are very simple and therefore very inexpensive to manufacture. A second advantage is reliability. Again these are very simple components involving very few piece parts to manufacture; the fewer parts that are involved then the less that can go wrong. The third and final advantage is that the system, while not optimal, does provide a reasonable amount of accuracy. When utilized on a small aircraft, carrying small quantities of fuel with a limited flight range the accuracy that is provided by this system is adequate. The fuel, within the aircraft’s tanks, is subject to the laws of physics. Therefore it moves when the aircraft moves. It is affected by gravity and centrifugal force. When the aircraft banks for a turn the fuel slops to one side. When the aircraft climbs the fuel flows to the back of the tank. When the aircraft dives the fuel flows towards the front of the tank. The float is in a fixed position and can only respond to the up and down motion of the fuel. If all of the fuel has moved forward and away from the float then the float will fall down and indicate a lower amount of fuel then is currently available, conversely if the mass of fuel gathers in the area where the float is located then the float indicates a higher amount of fuel then what is actually available. Only when the aircraft is flying straight and level will the system provide an accurate report of fuel quantity. These types of inaccuracies are intolerable on a long range aircraft which is carrying thousands of pounds of fuel. 2. The meter movement within the indicator is the most common type used, which is a 100mv, d’arsonval type. This means that it requires 100mv of electrical current to drive the pointer on the meter movement from zero deflection to full deflection. Where R= Resistance, E= Voltage and I = Current. Therefore the value of the resistive element to be used is equal to 280 Ohms at its minimum value, which would equate to a maximum current flow of 100mv. Therefore our resistive element must be variable from 280 ohms up to 2,800 Ohms. The operation of the system is now very straight forward, when the fuel tank is empty the float is at its very lowest point and the wiper resistive element follows the float. Therefore the wiper is at the point of the resistor which is closest to ground and furthest from the source of power or 2800 Ohms. This would provide only 1mv of power to the meter movement and only 1% deflection of the pointer or our Zero (EMPTY) setting. When the fuel tank is full the float and wiper both will be at their highest point, closest to the source of power or 280 Ohms. This would provide 100mv of power to our meter movement and 100% deflection of the pointer or our FULL setting. As the voltage is constant and both electrical current and resistance are perfectly linear then our pointer travel will also be perfectly linear. The indicator for a resistive fuel quantity system is typically a very simple instrument consisting mainly of a meter movement housed within a standard 3-1/8” case. On occasion the indicator may have some signal conditioning element within it, however that is quite rare and when it does occur even that will be a very simple voltage divider or a single stage amplifier. The most common meter movement used in these indicators is of the d’arsonval type and which is typically 100 milli-volts full scale. The tank unit is the component which gives the system its name “Resistive Fuel Quantity Measuring System”. The tank unit is comprised of a float which is mechanically linked to a variable resistive element. The float rides on top of the fuel and will move up or down depending on the level of fuel within the tank. The floats movement is coupled via a linkage arm and gear assembly to a variable resistive element which then mimics the movement of the float. The variable resistive element is comprised of two parts; a resistive strip, typically manufactured with Nichrome wire, and a wiper assembly. Nichrome wire has a predictable and stable resistance to electricity per inch of wire. Therefore it is possible to cut and form a piece of nichrome wire to a very exact electrical resistance value simply by adjusting the length of wire. The wiper assembly is a moveable electrical contact which slides across the length of the nichrome wire while making direct physical contact with the wire. In our fuel measuring system one end of the nichrome wire will be connected to the aircraft power source and the other end will be connected to ground. The wiper will tap a varying amount of electricity off of the nichrome due to its physical contact. The amount of electricity that is tapped is determined by the overall resistive value of the wire and precisely where on the wire that the wiper is making physical contact. If the wiper has moved 24% down the length of the wire then 75% of the electricity is tapped off; at 50% movement then 50% is tapped off; at 75% movement then 25% is tapped off. This relationship is very predictable and very consistent and operates precisely under the principles of Ohm’s Law (E=I/R). The electricity that is tapped off by the wiper is then transmitted by wire directly to the Fuel Quantity Indicator and is used to drive the pointer indicating fuel qty. In most resistive type fuel qty. systems the aircrafts own power source (14 VDC or 28VDC) is used as the power for the quantity system. While the aircraft power is reasonably well regulated it is not a precise regulation, hence the first negative for resistive systems. Aircraft power can vary from approximately 12.6 volts up to 17 volts on a nominally 14 volt aircraft. 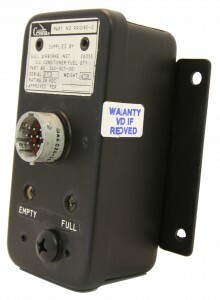 On a 28 volt aircraft the power supply can vary from 24 volts up to 31 volts. The aforementioned variances are under normal operating conditions, if the power supply is experiencing technical problems then the variance can be significantly more. The Resistive Type Fuel Quantity measuring system utilizes a variable resistive element in order to vary a precise electrical DC voltage based on the quantity of fuel in the fuel tank. The varying electrical signal, in turn, is used to drive the pointer on a fuel quantity indicator in a manner which is proportional to the amount of fuel in the tank, thereby visibly indicating remaining fuel quantity to the pilot. The purpose of the Fuel Quantity Measuring System is to provide the pilot with a visual representation of the amount of useable fuel which is currently being held within the aircrafts fuel tanks. Both of these systems provide fuel quantity information by varying a precisely controlled electrical signal. However the method of varying that signal is considerably different between the two. In general, while resistive type systems are reasonably accurate and reliable they do not provide the high level precision and extended long term reliability that is provided by the capacitive type system. As a result, in modern aircraft, resistive systems are typically relegated to lower cost, lower performance aircraft while higher cost, and higher performance aircraft will almost always utilize the capacitive systems.